Fruit flies are the perfect food for a young praying mantis. Also frogs, small spiders and ants will eat fruit flies. You can buy fruit flies in most specialized pet shops, but it’s much cheaper to breed them yourself. Here I will describe how to breed your own fruit flies. This is the do-it-yourself version without any special powders or fruit-fly-medium-mixes. It’s just stuff you can find in your kitchen or in a normal supermarket. The special mixes probably have better results or less hassle, but this method is easier and cheaper. Flightless fruit flies, like Drosophila hydei or Drosophila melanogaster with a mutation that makes their wings underdeveloped. They are not able to fly even though they have wings. You can buy them in specialized pet shops or order them online. Plastic containers with lid, with a volume around 300 to 600 milliliters. I use 500 ml plastic containers. Take a container with lid and take the scissors. Cut a oval or circular hole in the lid of the container. There should be at least 1 cm between the edge of the lid and the hole. A small hole is no problem. Take a piece of tissue paper and place it in between the lid and the container. The paper will allow air to pass in and out of the container without letting the fruit flies escape. The fruit fly food, called fruit fly medium, can best be made in quantities for around 8 breeding containers. Of course it’s also possible to measure the ingredients for less containers, but this will be a hassle. For 7 to 8 containers of fruit fly medium you need to mix 500 ml of beer with 200 grams of dry mashed potato powder. Mix it with a spoon or spatula. Add around 100 ml of white vinegar and stir again. The resulting mix should be smooth looking without obvious liquid puddles. If it’s too dry you can add a little bit of water. If it’s too liquid you need to add a bit more potato powder. If it looks good you need to add 1 small tea spoon of yeast powder to the mix. Stir it well and use a spoon to portion the fruit fly food medium to all 7 to 8 containers. The plan is not to fill the container up, the food should just take up a few centimeters of the bottom of the container. 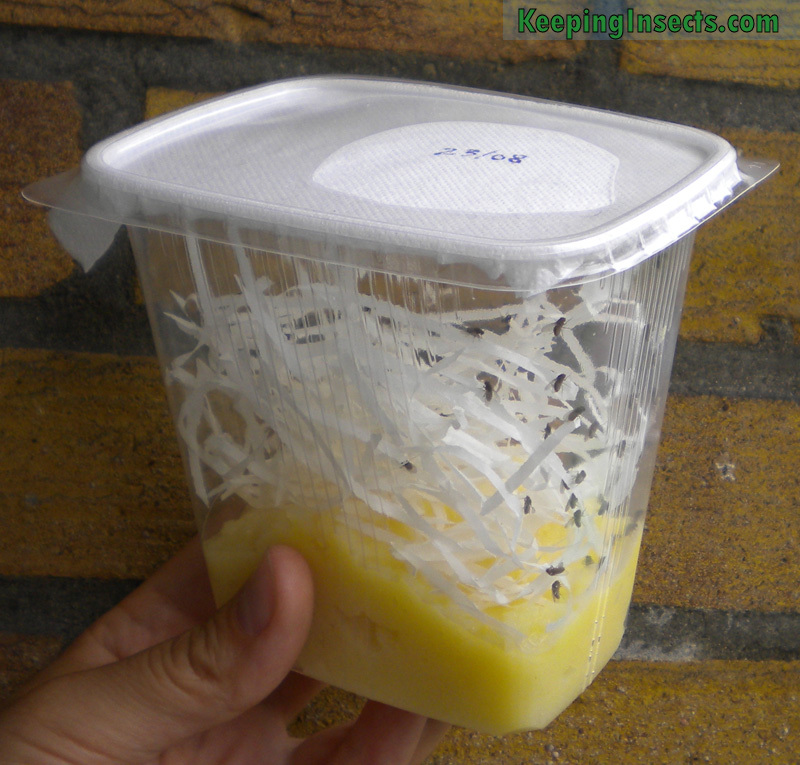 If you have the fruit fly medium in the containers, you can add the plastic strips to the containers. It should fall on top of the medium and stay there. If it gets engulfed in the medium you need to make the medium less liquid or you need to use better quality strips. Plastic or wooden strips are better than paper ones. The strips serve as stable ground for the fruit flies to sit on. They will drown in the medium without the strips when the medium gets more liquid after a few days (because of the activity of the yeast). Now it’s time to add the fruit flies! Keep the lid and fitted tissue paper close by. Open the new container and take the container with the live flightless fruit flies. Tap the container with the fruit flies firmly on the table, making all fruit flies fall to the bottom. Keep tapping and open the lid of the container. Tap all fruit flies to a corner of the bottom of the container and then shake or tap 15 to 30 of fruit flies into the new container. Tap the full container again on the table and close the lid. Tap the new container and close that lid too. Done! The 15 to 30 adult fruit flies will eat from the fresh food medium and will lay their eggs inside the medium. Already after a few days you will see tiny fruit fly maggots inside the medium. They will be hard to spot at first, especially for the small Drosophila melanogaster fruit fly species, but as they get older you can see a tiny black dot moving up and down in the medium. That’s the head of one of the fruit fly maggots eating away. Keep the container at 20 to 30 degrees Celsius. Development is faster at high temperatures. Don’t keep the fruit flies below 15 °C. At around 25 °C the development will take around 2 weeks. 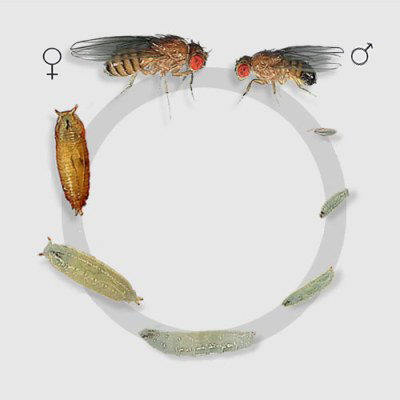 The smaller fruit flies (Drosophila melanogaster) develop a bit faster than the larger ones (Drosophila hydei). When you start to see fruit fly pupa on the side of the container you will know that the next generation is just a few days away. The pupa of fruit flies are orange – brown in color and stick to the walls and paper of the container. The food in the container will dry out a bit after 1 to 2 weeks, this is not a problem. At this time the food is almost depleted and the maggots will have reached adulthood. If you are not planning to feed the fruit flies to your praying mantis soon, you should add a little bit of medium or a small piece of fruit to the container to make the adult flies live longer. Will breeding fruit flies smell bad? If everything works out correctly there will be minimal smell to breeding fruit flies. If there are some problems in the food medium it could start to smell. For example if fungus starts to grow or if the food medium is too liquid. If you start adding weird things like fruit or sugar the medium will smell bad for sure.